Patrick Hawes is a composer mainly associated with big, bold, tonal works in a highly romantic contemporary vein, inspired by the music of the English Romantics. 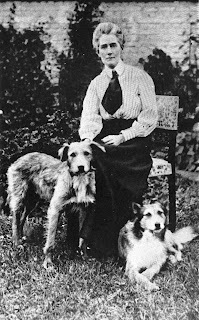 His Eventide: In memoriam Edith Cavell was commissioned by Sheringham & Cromer Choral Society and first performed in Norwich Cathedral in 2014, and will be receiving its first London performance on Monday 12 October 2015 at St Clement Danes Church as part of the Brandenburg Festival. Commemorating the nurse Edith Cavell who was executed by the Germans during World War I. The performance features Charlotte La Thrope (soprano) in the role of Edith, with the Addison Singers, Tiffin Boys' Choir and Brandenburg Sinfonia conducted by David Wordsworth. Tickets are available on-line from EventBrite, but if you buy through the Cavell Nurses Trust website then 50% of the ticket price goes to them! Eventide is the name of the hymn tune Abide with Me which was recited by Edith Cavell and an Anglican Chaplain the night before her execution. The hymn is used as a cantus firmus throughout the work, whilst the soprano soloist takes on the role of Edith herself singing words from her letters, The Book of Common Prayer and Thomas a Kempis' The Imitation of Christ. The chorus provides a key role, mirroring Edith's thoughts and bringing the work to moments of intense climax.